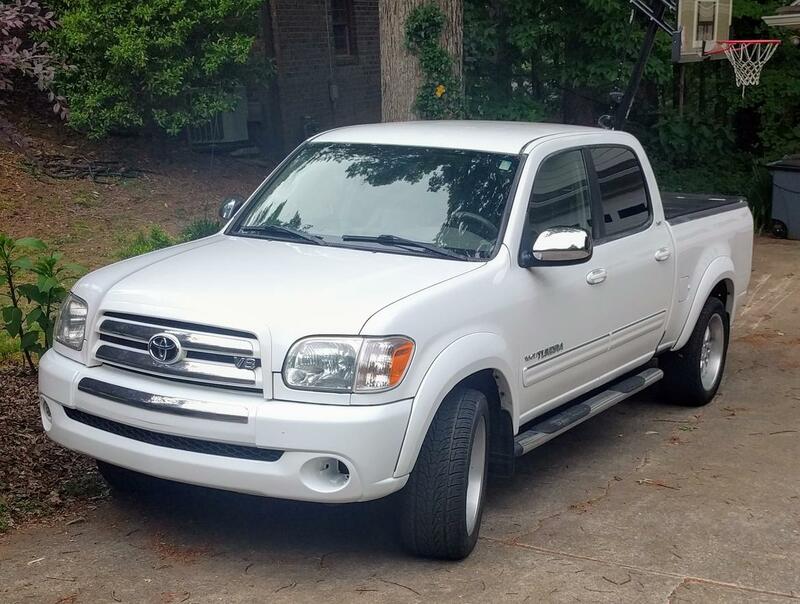 Introducing my new 2006 SR5 Tundra. 2-wheel drive. Has the XS-P package which I believe is a southeast region special edition that includes leather interior and BBS wheels. 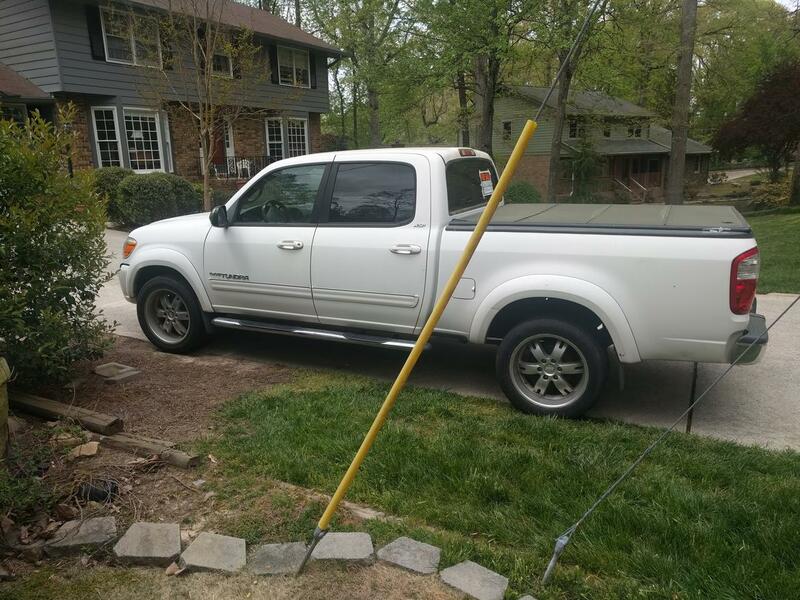 A week ago I saw this pop up on Nextdoor with a poorly titled ad ("Truck for sale"). I called and got some details then got distracted. Called again over the following weekend and it hadn't been sold so my wife and I went to see it. 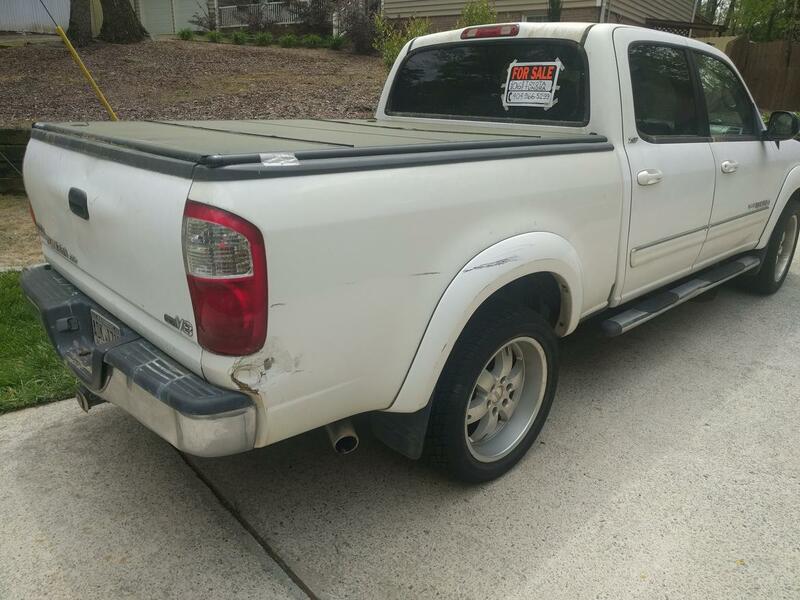 Found out it is a one-owner Georgia truck. It has a few bumps and bruises but the frame looks perfect. No rust other than where it is dented. Timing belt status is unknown - so that's on the to do list if I can't confirm anything by calling some shops on a Carfax report. It runs good, has a few bruises and bumps... and it's filthy. Quarter million miles. 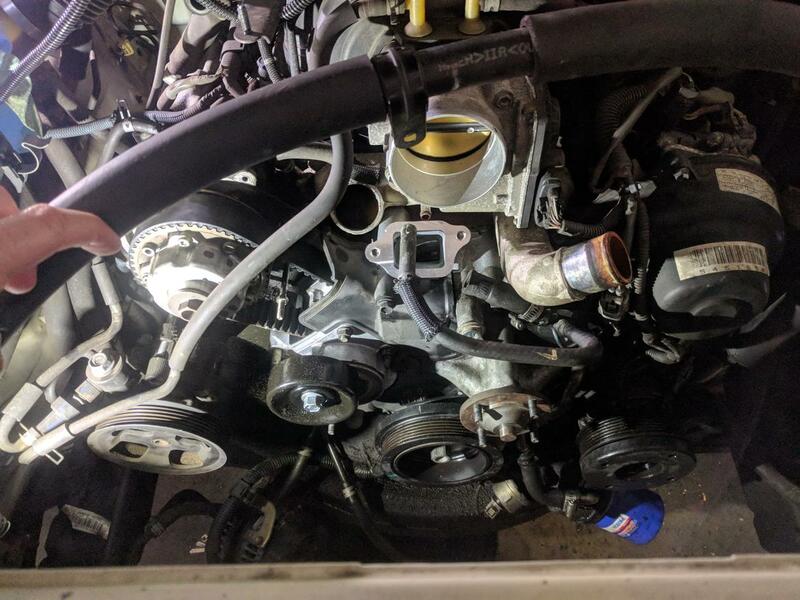 Called several shops on the Carfax history and found no evidence of the timing belt being replaced. Kinda what I expected. Mechanic buddy quoted me three hundred for labor to replace it... Which is a really good deal so that's getting done in a couple weeks. Changed the air filter and engine oil and pulled a sample to send to Blackstone. Had the transmission and rear diff oil replaced. Discovered the radiator is leaking, so that'll be replaced with the t-belt. Front lower control arm bushings are shot and it needs an alignment, so I'm going online shopping this week. Same mechanic will coach me through replacing the LCAs in my driveway while he replaces the timing belt. I'm pretty sure this truck sat under a tree for the last decade - every crease and crevice was full of dirt. After a couple hours of patient progress, it's pretty clean now. I discovered a scary amount of leaves and dirt above and below the weep holes at the bottom corners of the windshield (and down inside the fenders). Shop vac with a skinny nozzle made quick work of that and the drains are open again. The first owner was a painter and it's got quite a bit of paint splatter on the paint. So I have to figure out how to get that off. Fortunately the inside wasn't "painted".. but it was still pretty rotten. I don't think the interior has ever been cleaned until yesterday. Three hours with the shop vac and some brushes and scrapers and Clorox wipes, and it's pretty decent now. I ordered and installed some Weathertech mats up front, and did a r/r of the lower dash to get the power mirror switch back where it belongs. All in all, a pretty good first week for my ratty truck. Maybe take some pictures. (First project thread, so I'm living and learning). 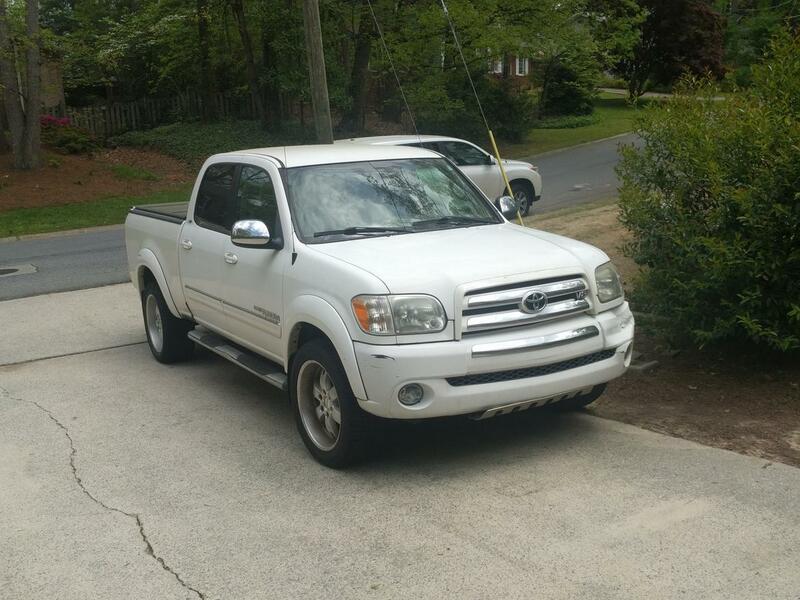 I've got the same truck in a 2004 4x4 and I just love it. Mine has *only* 140K. I had the timing belt and water pump done right away too. The brakes on mine were TERRIFYING! I replaced them with Hawk rotors and pads, and they're solid now. The size is just right, I think. Packs and tows like a big truck but isn't a giant pain to park. Still a pain, but not like an F250 or something. Very comfortable vehicle for long trips. I had a black XSP for a few years. I loved it! The 05-06's are especially nice since y'all got an extra gear in the trans and an extra 40 hp over the 00-04 models. That said, 235k miles on my 01 and I still love it. I received the title in the mail today and it indicates the mileage is “exempt”. 250k miles sure seemed like enough... and I wrote an actual number on the title app, so I’m puzzled. I think I will visit the tax office and see if they can tell me anything. Seems Unlikely but worth a try. Maybe the mileage is even higher! Or I could just assume it was a mis-entered number at some point and not worry about it. With a little love that will be a good looking truck. 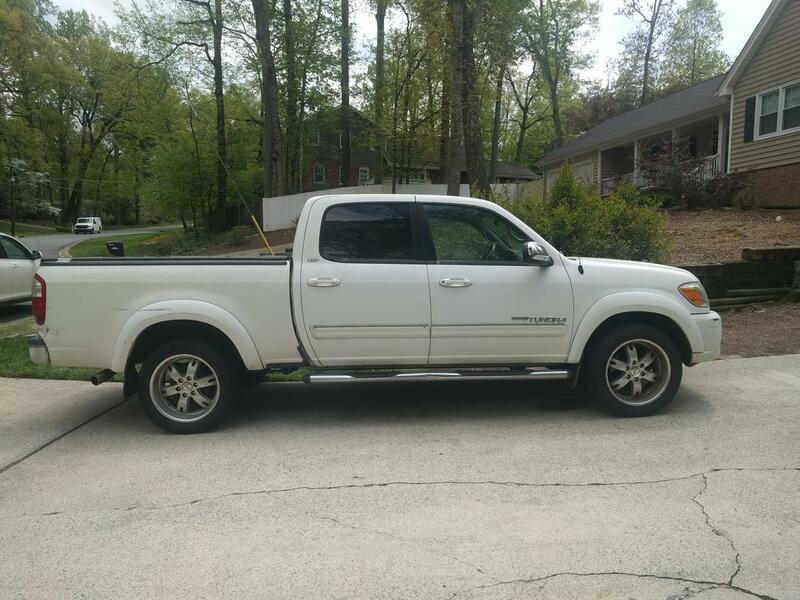 I've got an 06 Double Cab. Ironically, also from a painter PO. Grea trucks, underwhelming brakes. I have some NOS factory floor mats in dark charcoal hoarded if you ever need a set. Mileage exempt on your title just means it’s over 10 years old most of the time. 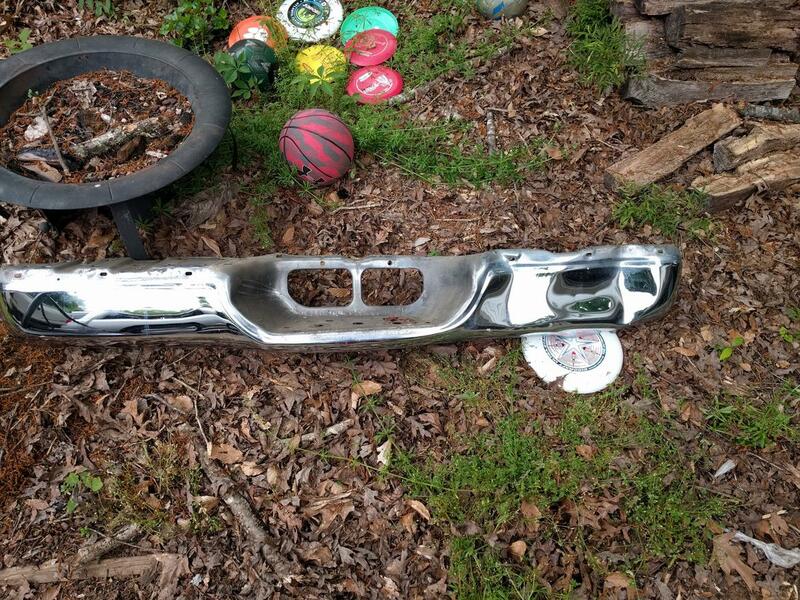 I searched online junkyard inventories (for a used front bumper cover) over the last 2 weeks. I had hoped for a homerun but I struck out - couldn't find anything locally. All the ones in good condition seem to want around $350-400 or more plus shipping. 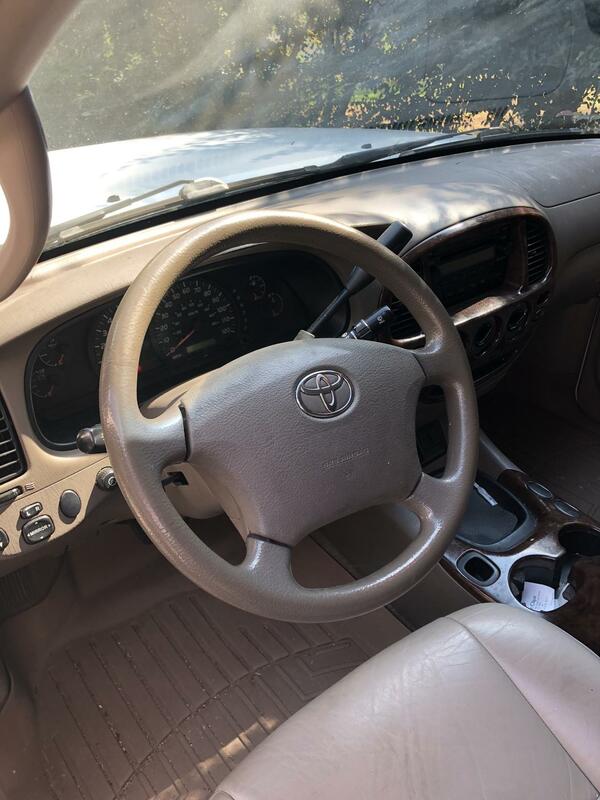 Thanks to the internet I was able to identify an actual part number, and I found some genuine Toyota parts sellers online at list minus 25-30%. At that discount, a new bumper cover is about $220 + a little more than that again for paint - so I convinced myself that new seems logical. 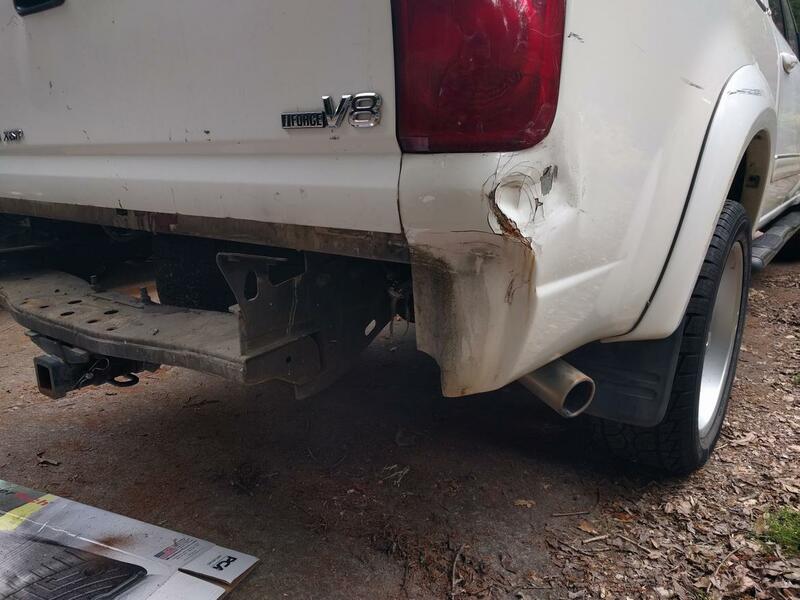 A truck bumper is expensive to ship so I called some local dealerships (there are several in Atlanta) to see what they could do. The first 3 dealership parts guys all wanted list or higher. I called a fourth and was initially told the same, so I said I would have to keep looking. That triggered the parts guy to say "well my job is to SELL parts, so what do you want to pay?". I told him 70% of list and he said he could do that to make a sale. 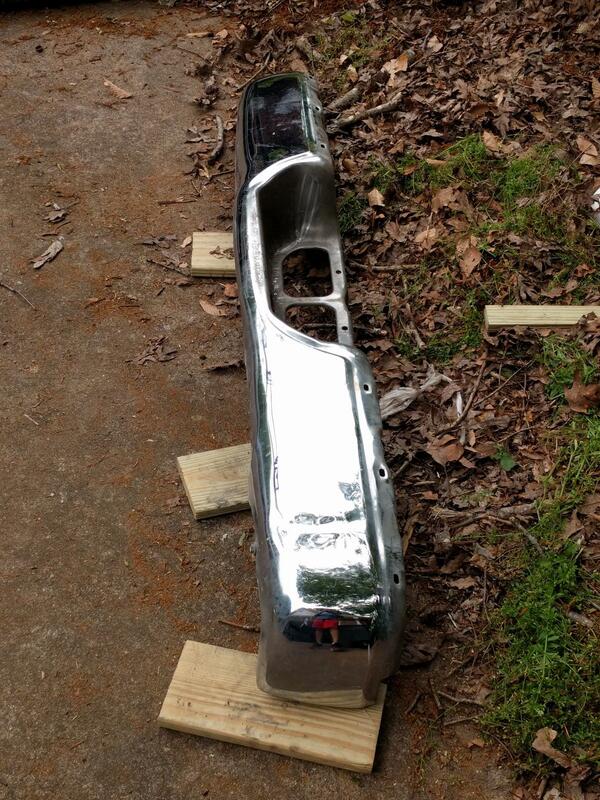 I was surprised - so I ordered the bumper cover .. plus new front LCAs, upper and lower ball joints. Ouch. I also did some more parts shopping for an Aisin timing belt, a water pump, a t-stat, a radiator, hoses and accessory drive belt - to be here for tomorrow's wrench session. It's a damn good thing I only paid 10% of the price of a new loaded truck. I removed the rear bumper, and now can see the full impact of the impact. I also noticed the gap at the tailgate is approximately -1/32"..rubbin'. But I found a small local body shop that is going to fix this corner and a few other blemishes, and also paint and install the new front bumper for me. I started this thread seeking help about the bent bumper connection. With some wood scraps, a hammer and spud bar I was able to make this piece of bacon..
Not very good .. but better than it was. T-belt, t-stat, tensioners, radiator and hoses replaced. Old belt wasn't original as I feared, but now it is new. Suspension parts postponed a few days.. hopefully not too many because these 295/45R20 tires are spendy. Back from the body shop. New front bumper and fixed back corner. Still need a replacement fog light and a steering wheel. Back bumper (not in the photo) is back on - looks crappy but I'm going to live with it for a while. Pretty happy with it so far, and with bringing it back away from the cliff. Far cheaper than a new one. Nice truck! My parents have a '00 regular cab 4x4 that I regularly borrow for truck stuff. I like it a lot, drives really well for a truck and the size is perfect, small enough to park but still tows and hauls enough. Theirs only has 145k or so on it, but it's been flawless mechanically. Unfortunately, it has been plaugued with the frame rot issue and will probably still be mechanically tip top when it rusts in half. I know a couple guys at work, though, with 250k or more on their first gen Tundras, needing nothing more than regular fluids and consumables. 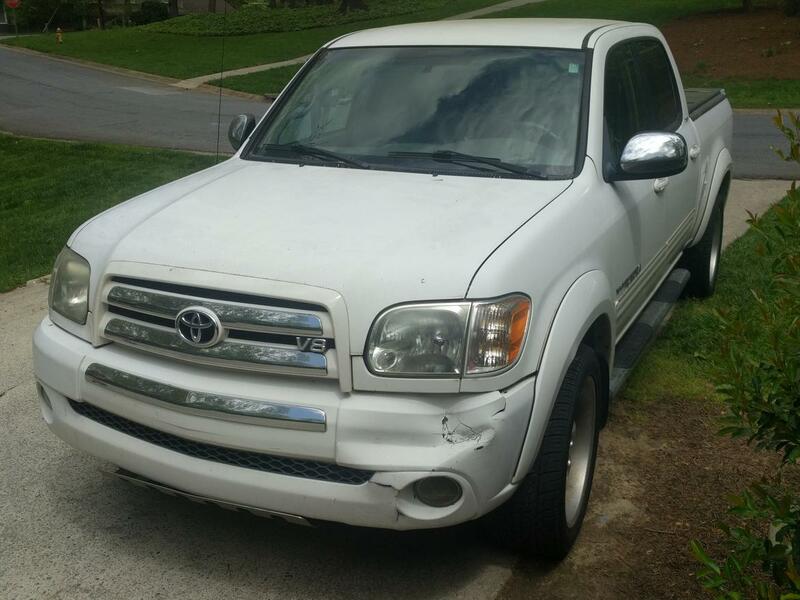 I have a former coworker whose 2003 Tundra has 660k with only consumables + a starter. His experience made me feel alright about this one with a quarter million miles. The brakes on mine were TERRIFYING! I replaced them with Hawk rotors and pads, and they're solid now. Do you have a part number or link for the Hawk rotors and pads? The mechanical bits in the front end were totally worn out when I got the truck. 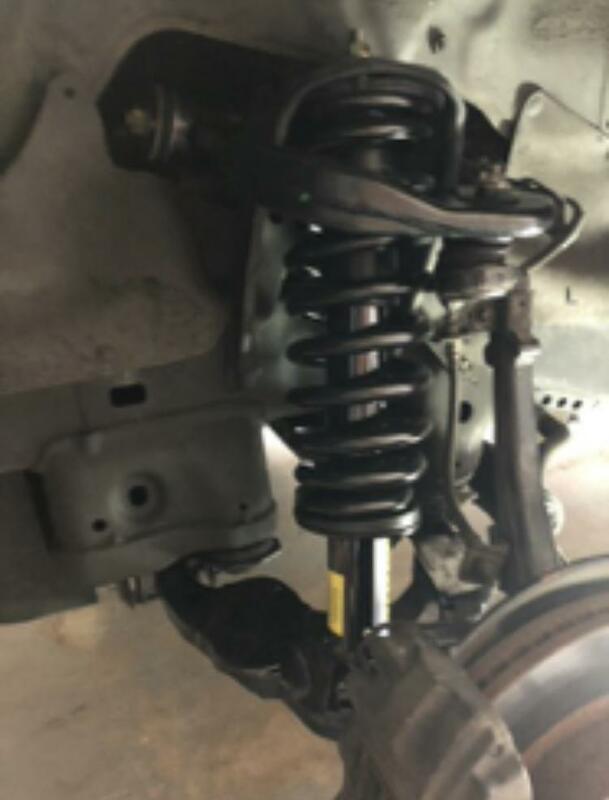 Now it feels solid after installing new (Toyota) lower, upper ball joints and LCA's over the weekend. The ball joints in particular are a well known wear item with these. The same mechanic buddy (with all the right tools) and I made this stuff a four hour exercise with no drama. 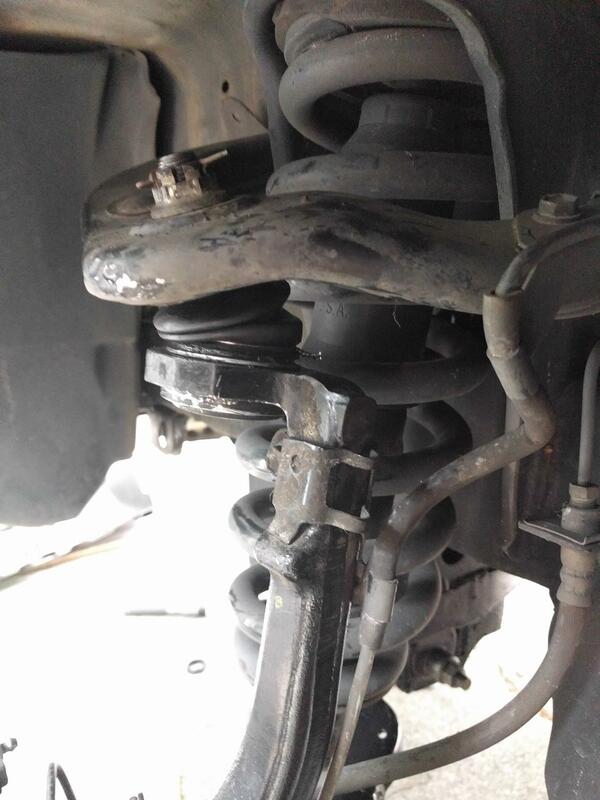 The only noteworthy challenge was the need to loosen the power steering rack to remove the back pair of LCA bolts. Big thanks to whoever posted the factory service manual over on Tundrasolutions, for all the torque specs. Whew, it's been about 6 years and I couldn't find any documentation on what I bought. I bought everything from Tire Rack, and I'm pretty sure I got the LTS pads. I just looked at the rotors, and they don't look quite like anything offered on the website anymore. I thought they were Hawk rotors too. Could have been something else. So helpful, right?! Edit: if you go on the Hawk website they do have a couple different rotors for the Tundra. The "QueitSlot" (surely that's a typo on their part) looks similar to what I have on my truck. The Sector 27 looks a bit more racy. 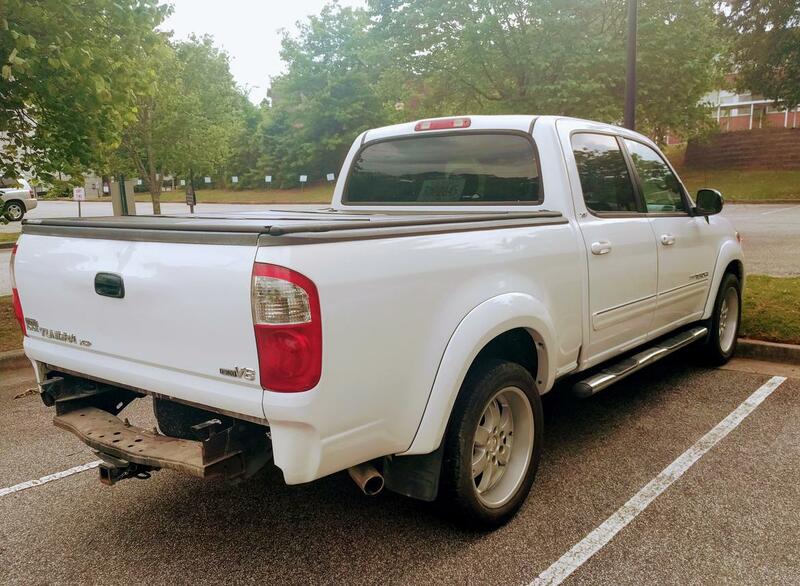 Been driving my truck a little (I park and ride a Marta bus and train - paid for by my employer - so weekday daily round trip is under 3 miles). It’s a good thing because I got 11 mpg from the first tank. 14 from the 2nd. 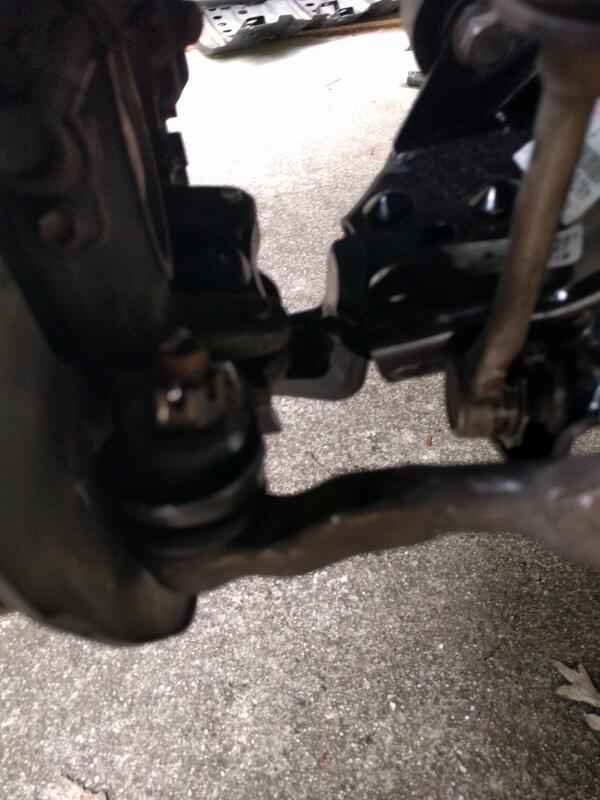 After replacing ball joints and LCAs I still had an ornery clunk up front. I ignored it all summer until today. I replaced the remaining front end parts with new UCAs and strut/spring packs from Rock Auto. The clunk seems to be eliminated. I also bought replacement fog lights off EBay over the summer, and it is looking pretty decent. I’m not a fan of the 45 series tires but they will remain for a long time unless I find somebody wanting to swap. Disconnected battery to avoid surprise explosions. 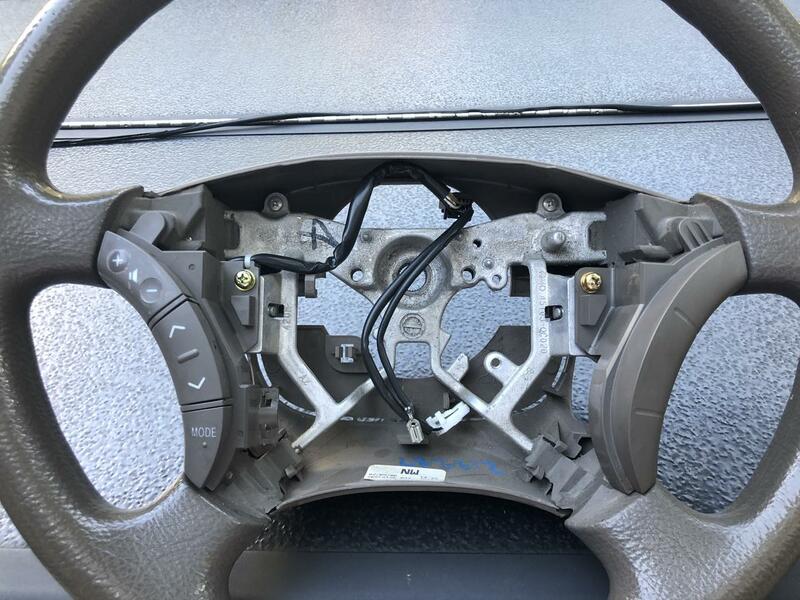 Pulling two plastic covers on the sides of the wheel, then removing two torx bolts allowed the airbag section to come off. Then I took pictures of the various wire connections and un-clipped everything. Loosened the center nut and marked top dead center. According to Youtube these can be removed without a puller so I tried the brute force method and it worked. After first drive, discovered the junkyard wheel was bent. My fingers hitting the windshield wiper stalk seemed strange. 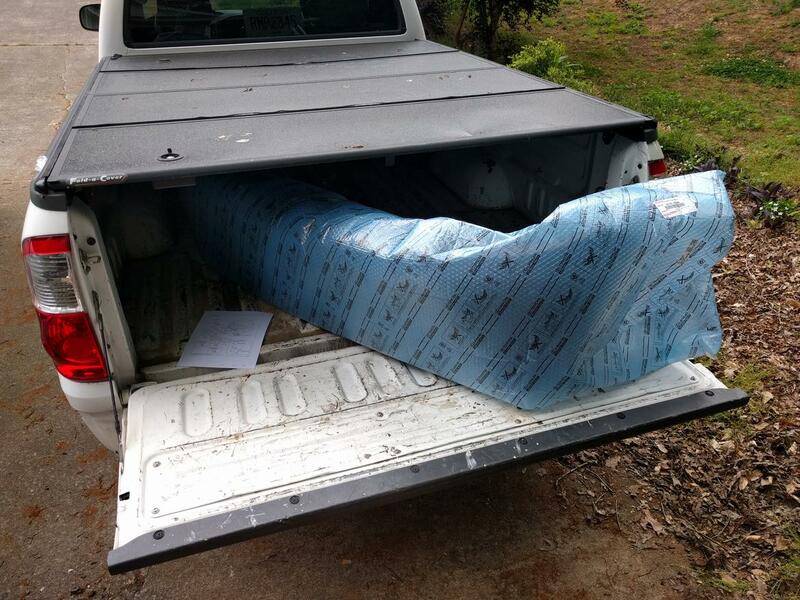 I contacted the yard (they had shipped it to me from California) and explained the situation. 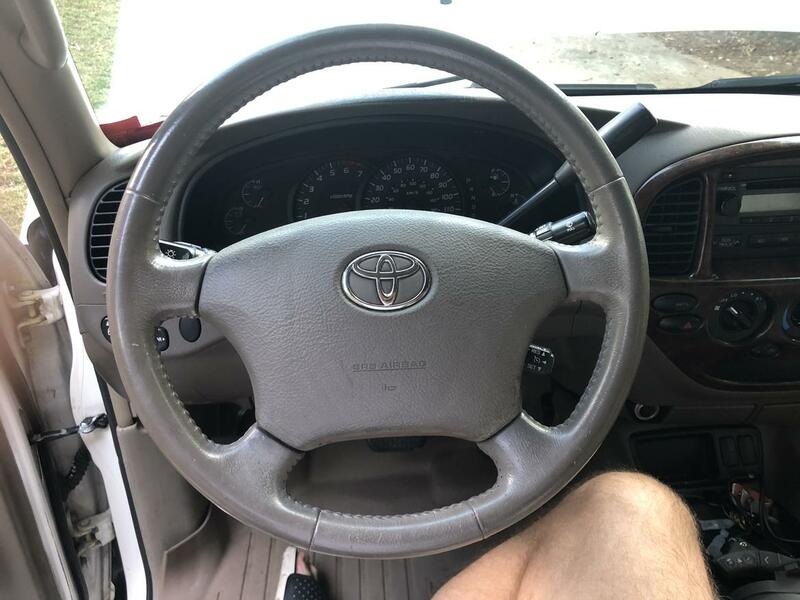 They offered to send a replacement, so now I have an upgrade - a leather wrapped wheel from a Sequoia. 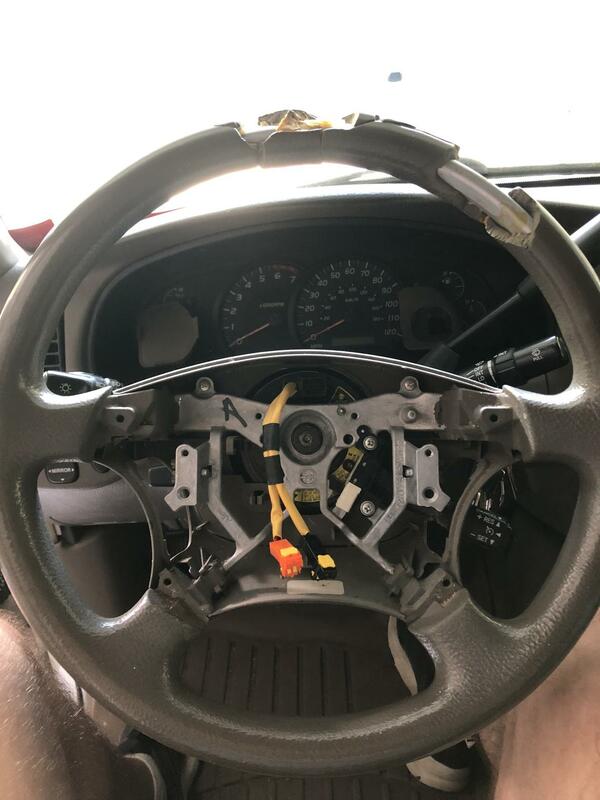 This last time I pulled the battery cable and disconnected and the re connected the airbag, the truck forgot how to idle - and the check engine light came on. I took it for a twenty minute drive and it seems to be idling normally once again, by the time I got home. I haven’t started it since but I am hoping the CEL goes away. Nice looking truck. If my Jeep blew up today these (and Sequoias) are on my short list of replacements I could pick up pretty quick that check all my boxes. The prices seem to be dropping even for lower mile, 4x4 examples. After some driving around to allow the computer to re-familiarize itself, the CEL remained. I visited Pep Boys for a free OBD-II code check. P0101 Mass airflow sensor out of range. It seemed to run fine but still dropped to around 450-550 rpm when stopped in traffic. After the scan, the CEL went away but the truck was still behaving the same. Continued low idle after warming up and putting the truck in gear. This is weird because it ran great prior to me pulling the battery, and the airbag and swapping the steering wheel for a third time. I called a mechanic friend with a snap-on scan tool and I told him that I’d swapped the wheel with the truck parked on my driveway (which is very steep). He suggested that resetting the computer with the yaw sensors at an incline may be the problem... then used his scanner to do a “zero point” reset of the electronics. ...which fixed it! Truck runs like a champ again. 251,000 miles. Good tip, and I'm glad the issues went away, but this all sounds a bit strange. I can accept that the yaw sensors might get freaked if they come to life on an incline, even though (i) that's actually a pitch problem and (ii) you'd think that they'd have some sort of built-in idea of what "normal" was. Where this whole scenario goes weird for me is when the mass airflow sensor gets involved. Does its behaviour really change on a steep hill? Does the MAF, by design, interface with the stability control? Isn't that a bit like being able to select only odd-numbered radio frequencies when the car is turning left? I can grudgingly accept it if the answer is "Because Electronics," but if there's actually a logical explanation here I'd love to hear it. In reply to Stealthtercel: I would really like to know as well. The yaw sensor probably is not the culprit, it was just one of several sensors he mentioned that the “zero point reset” ... actually resets. I also wonder if the CEL cleared on the dash because of the pep boys scan. I didn’t see the mechanic manually clear anything but he may have while I was shooting a photo of the code. Lastly, I suspect the low idle pulling very little air may be what caused the MAF to report out of range. I need to get some MAF cleaner and see how dirty it is. Got another CEL last Friday so I bought a Bluetooth scan dongle. P0101 again. MAF sensor out of range again. Bought a can of aerosol MAF sensor cleaner and sprayed it down and put it back in. 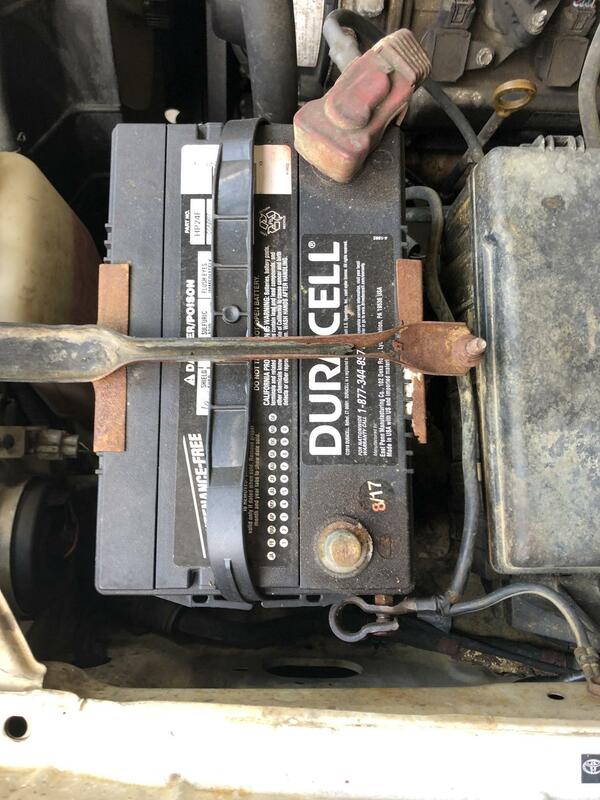 I pulled the battery before this exercise, just in case and when I reconnected it was deja vu all over again. Low idle again. E36 M3. I also realized it’s basically operating in some kind of limp home mode. Minimal throttle response. 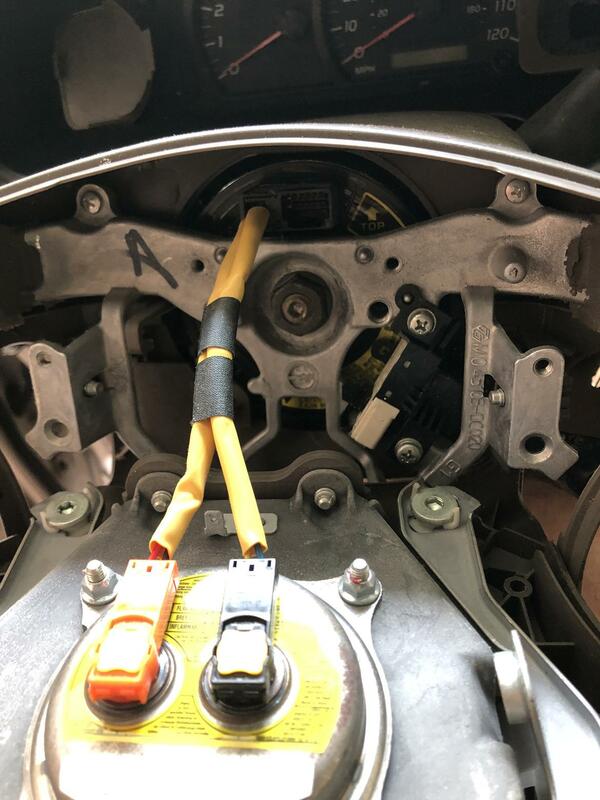 So I posted a separate thread on GRM and was tipped to read up on vehicle computer and idle (2006 Tundra has drive by wire throttle) “re-learn” procedure to teach it how to idle again. That reading led me to some ancillary P0101 concerns - one being dirty throttle body. I’d never cleaned one of those, so I hit YouTube and then made another trip to the FLAPS. Bought a can of aerosol TB cleaner and some microfiber rags and proceeded to make two rags filthy. The TB was way overdue for a cleaning. 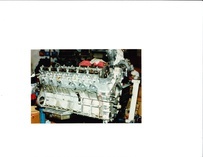 After re-assembly and re connecting the battery, the 2UZ-FE roared back to life and held a proper idle, sans CEL. Sweet success for this (auto) mechanical neophyte. I’m enjoying gaining confidence to do this stuff as I learn. Thanks for coming along.